The newest member of the Whalehazard family, the Nebula is here to help you hold down the low-end. With lines reminiscent of our six-string models, an offset body and a long upper horn, the Nebula balances well on a strap and will make sure the crowd is looking at you and not the guitar player. Easy fret access and carved areas for your forearm and beer belly make this bass even more comfortable and fun to play. A humbucking pickup with push/pull volume and tone knobs give you a variety of tonal options. Available in a wide range of wood and finish choices, as well as electronics and hardware. 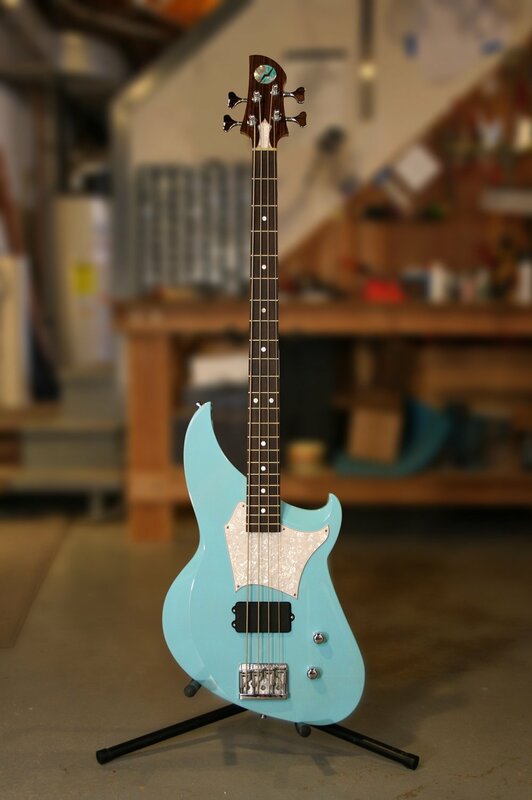 View more photos of the Nebula Bass in the photo gallery. Order a Nebula Bass Today!